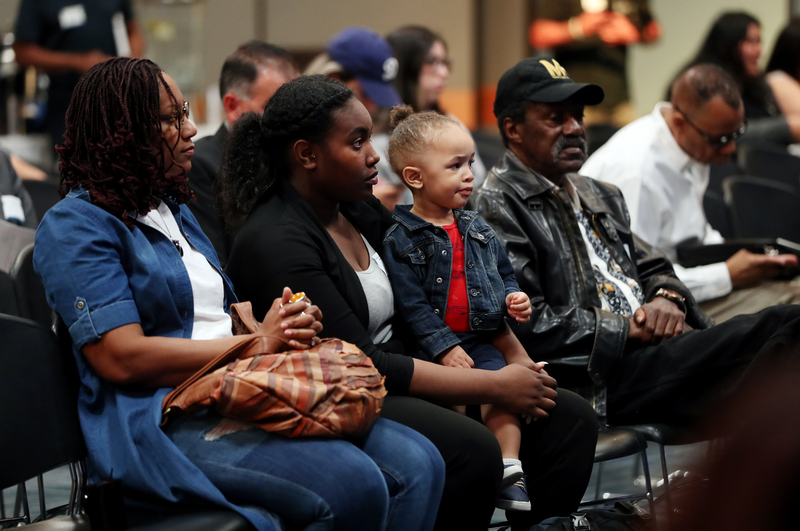 The April 13 symposium on race relations and social justice at Cal State San Bernardino offered panel presentations, breakout sessions and a keynote address by award-winning social change agent and former senior adviser and vice president of the W. K. Kellogg Foundation (WKKF), Gail C. Christopher. 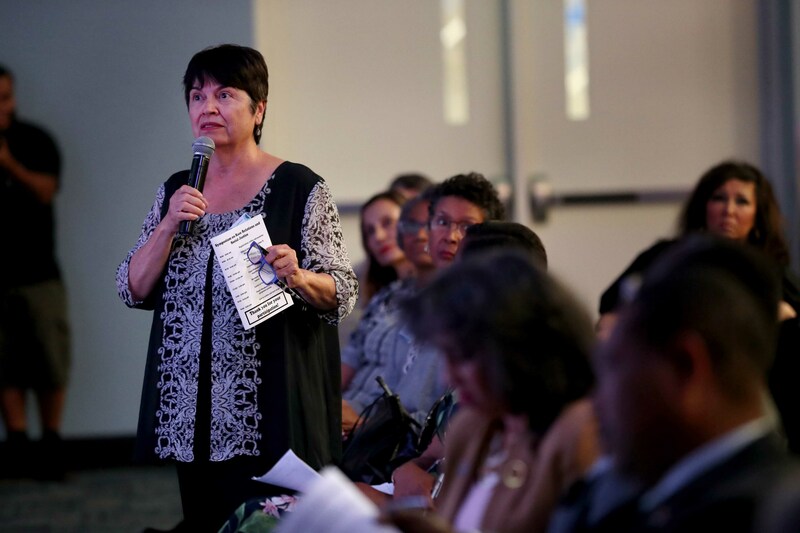 The event, “Dismantling Systems of Racism and Exclusion for a Better I.E.,” was hosted by CSUSB’s University Diversity Committee, in partnership with Westside Action Group. “We live in a time when racism and social justice are prominent in the daily news and in the minds of many across our country,” said CSUSB President Tomás D. Morales in his opening remarks. “Young and old, representing the spectrum of ethnic cultural and socioeconomic groups – we have to unite. We have to confront these issues on the national level and confront them on the regional level. Cesar Caballero, dean of the John M. Pfau Library and chair of the University Diversity Committee, acknowledged the important role colleges play when it comes to societal concerns. 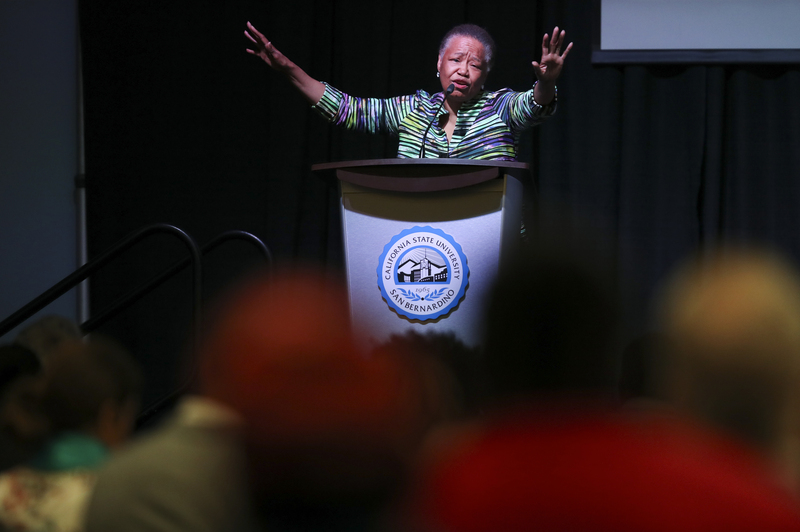 In her speech, Christopher, the visionary for and architect of the WKKF-lead Truth Racial Healing and Transformation (TRHT) effort for America, focused on the false belief that some people are worth more than others. “My message this morning is summarized in three words: we deserve better,” she said. “This region, this nation, this critical time in the evolution of humanity can be summarized in the reality that we deserve better. “Yes, we’ve fought the good fight for many decades; we had a civil war in this country, we had the Civil Rights Movement, we had reconstruction,” she continued. “But how is that we always circle back to the manifestation of a hierarchy of human value? I submit to you that we circle back because we never dealt with it. “I believe that we must jettison the fundamental undergirding fallacy of a belief in a hierarchy of human value. And when that has happened, we will truly transform this country,” she said. Christopher explored the five frameworks of the TRHT – narrative change, racial healing and relationship building, separation, law and economy – and how these aim to help communities heal and produce actionable change. “It is a truth and reconciliation process for this country,” she said, explaining that 150 organizations came together and worked for seven months to do a collaborative co-design effort around the framework for the TRHT. Christopher also acknowledged the fact that biases are inherently within everyone, but highlighted the importance of dismantling them. “This notion of overcoming our biases, it’s not somebody else’s work – it’s all of our work,” she said. Discussions and breakout sessions followed Christopher’s speech, focusing on homelessness, food insecurity, mental health, the school-to-prison pipeline, drug addiction, and the need to develop future inland region leaders. Sponsors included Westside Action Group, No Kid Hungry Campaign, CSUSB’s President’s Office, University Diversity Committee, and the John M. Pfau Library. Christopher is the visionary for and architect of the WKKF-led Truth Racial Healing and Transformation (TRHT) effort for America. TRHT is an adaptation of the globally recognized Truth and Reconciliation Commission model, having evolved from the decade-long WKKF America Healing initiative, designed and led by Christopher, which advances racial healing and racial equity. Over the last 10 years, Christopher was responsible for several other areas of foundation programming, including food, health and well-being, leadership, public policy, community engagement, and place-based funding in New Orleans and New Mexico. She is a highly sought-after speaker on racial healing, the human capacity for human caring, and the social determinants of health and wellness. Christopher holds a doctor of naprapathy degree from the Chicago National College of Naprapathy in Illinois and completed advanced study in the interdisciplinary Ph.D. program in holistic health and clinical nutrition at the Union for Experimenting Colleges and​ ​Universities​ at​ ​Union​​ Graduate​ ​School​ ​of​ ​ Cincinnati,​ ​Ohio.